John Hillcoat knows death, directing it as he sees fit time and again. The Proposition (2005) is a gritty Australian flick where killing is the only way to survive. The Road (2009) gives us a look into a dismal future where life has lost its color. And Triple 9 (2016) should be a film in which a dozen main characters bite the dust. Lawless is no different, becoming another dark Hillcoat drama that orbits death like the sun, creeping closer and closer until everything burns. Come to think of it, Lawless has ever more in common with Hillcoat’s other films; family ties, dangerous disorder, and Guy Pearce, who appears in many of Hillcoat’s projects. But while The Proposition and The Road have a depth that goes beyond your standard Hollywood wasteland film, Lawless and Triple 9 appeal more to the masses, priming them for financial success perhaps, but taking away a bit of their magic. During the 1920s in Franklin, Virginia, bootlegging moonshine was a typical occupation. Alcohol had been prohibited in the United States, but many turned a blind eye to its illegal sale, including politicians and officials on every level. Three down country brothers made their living with stills in the hills, creating a tiny empire in the woods where no man dared speak against them. Howard Bondurant was the oldest, the muscle, the brew master. Forrest was the brains of the operation, a man some said couldn’t die. And Jack was the youngest, a boy who loved his brothers and wanted to make them proud. When new law moved in on the region wanting a piece of the profits, a war would break out. And this small war would take many lives before it ran its course, changing the way of life of a region that had always held itself outside the law. 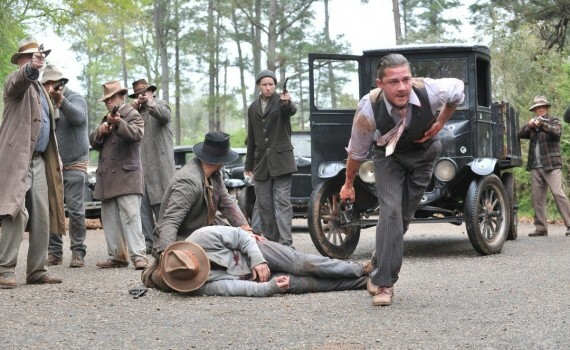 Dark and bloody, yes, but also mainstream, Lawless feels more like a 90s film than a modern crime/drama. It has an old school vibe; the brothers, the law, the backwoods, the narration, the Tommy guns, the villain, the heroes. Everything about it comes across as more of a crowd-pleaser than an original work of art, something that will be to the liking of a large number of audience members, but wasn’t exactly what I was looking for. Hillcoat’s earlier films are slowly, heavier, and more meaningful, while Lawless is more of a surface story. Not badly made, but a bit typical. What is not typical is this cast, a shocking stockpile of names & talent. LeBeouf, Hardy, Clarke, Guy Pearce, Jessica Chastain, Mia Wasikowska, Dane DeHaan, Gary Oldman, Noah Taylor; I was blown away by the amount of talent on display here. LeBeouf was solid as the lead, Hardy practiced his Mad Max grunts, Pearce was perfectly hateable, Chastain was as bad as always, and the side characters filled their roles nicely. Overall, a fine film, one that is gruesome, vindictive, & exciting, but ultimately feels a little dated & done.